The LG 25UM58 is an attractive 25″ ultra wide monitor. The 25″ size format would be a little small for my taste, remember that ultra wides will be shorter than the standard wide screen equivalent, so if you are used to a 24″ wide screen you might want to look at the bigger sizes, fortunately this model also comes in 29″ and 34″ formats but of course the price does start going up. The LG 25UM58 isn’t marketed as a gaming monitor but it does feature a gaming mode and has good response times for an IPS panel. 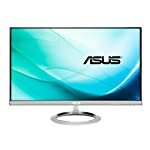 If you are looking for an ultra wide screen at a good price then this needs to be investigated further. For the price, this screen offers a lot, so as long as you are comfortable with the size then this could bring the ultra wide format into your bedroom. This ultra wide monitor might be a bit on the small size for some people’s taste. Remember, it will be shorter than a more standard wide screen 25″ model. But that might suit you down to the ground, if you want to keep costs low and have limited desk space then it makes for a good choice. Connectivity is well catered for, you get a good range of inputs available – HDMI 2.0, DVI-D and D-Sub. The design itself is attractive and the slim bezels are appreciated on a model in this price bracket, I think it really helps to give this a premium look. The stand isn’t the most adjustable in the world, it has a small degree of tilt, but it can be removed if you wish to mount this on something alternative (VESA 75 x 75 compliant). It doesn’t look quite as solid as some of the stands on the larger ultra wide screens but then it won’t need to be. The on screen controls are pretty cool, LG have a system that allows you to control the monitor configuration using the computer’s mouse. So do away with fiddling with buttons round the back, this is a great way to switch up your settings. Should you particularly like using physical buttons, there is a joystick too! The 25″ model is not listed as including speakers, but it does have a 3.5mm headphone output. The LG 25UM58 features a high quality IPS panel whilst keeping the price affordable. IPS screens allow for improved colour accuracy and viewing angles. They don’t quite match the response times of a TN based screen but they are good enough for gamers. 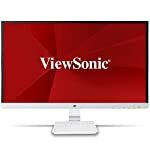 The ultra wide aspect ratio of this monitor means that there are more pixels for your graphics card to push around so if you upgrading from a wide screen 1080p make sure your graphics card has some spare capacity else you’ll see a drop in performance. A current generation mid range card should have no problems with this, something like the GTX1060 or RX 480 will be fine. Most software should scale correctly to the wider format but note you may have some issues from time to time, fortunately as the 21:9 ratio becomes more popular this is becoming less of a problem. Even some consoles are able to scale to this format so you can game without bars down the side of the screen. PC games are used to running at different resolutions but some older games may require some additional setup to get going. We give the LG 25UM58-P a 4.5 out of 5 rating. Want to know what existing owners of the monitor think? You can read real user reviews here. 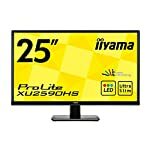 Should I buy the LG 25UM58-P? The LG 25UM58 is an ultra wide screen, at only 25" it might appear small for some as it will appear shorter than a 24" standard wide screen monitor. But assuming you are comfortable with the size you get a well finished attractive IPS monitor for your desk. If you are having some doubts about this purchase then why not read some real owner reviews and see what other buyers think. Welcome to the LG 25UM58-P FAQ. This section attempts to answer common questions you may have, please get in touch if you have any more queries or if you think our answers need updating. Does it have built in speakers? It seems that there are different versions of this monitor with some users reporting back that theirs did not include speakers. Check the specification carefully when you buy. Your retailer will be able to help you out and remember, UK buyers, you can always return it if not completely satisfied.